Pennsylvania is a long time big time hunting state, with such a great and famously known outdoors sports tradition that the iconic red and black “buffalo check plaid” wool coat made by Woolrich, Filson, and other long established wool clothing manufacturers was dubbed the “Pennsylvania Tuxedo” back in the 1920s. Today our clothing may have improved since then, or may not have improved, depending upon whether you like your hunting pants to be flammable, or not, and I do not (which means I prefer wool in all outdoor clothing), but one thing remains steady: Pennsylvanians rightly love to hunt. And just as much as we love to hunt, we are also generous with the fruits of our time afield. We have a long tradition of sharing the fruits of our hunting labors. Well do I recall as a kid waking up in late November or early December to find some fresh venison left on our doorstep by one or two of our neighbors, all of whom had big farms and all of whom were big time hunters. Back then in that area, kids brought fresh venison jerky to school to share and trade with other kids during and right after deer season; everyone had their own proprietary jerky recipe that they liked and were proud of. Sharing venison is a real longstanding Pennsylvania tradition. Back in 1991, local hunter John Plowman had a vision to harness that generous spirit among Pennsylvania hunters and use it to provide for the needy. He started Hunters Sharing the Harvest, which today annually supplies well over a hundred thousand of pounds of fresh, free range, wholesome, lean, natural, organic meat to Pennsylvanians in need. That translates into about 667,000 annual “meals” for individuals and families in need. 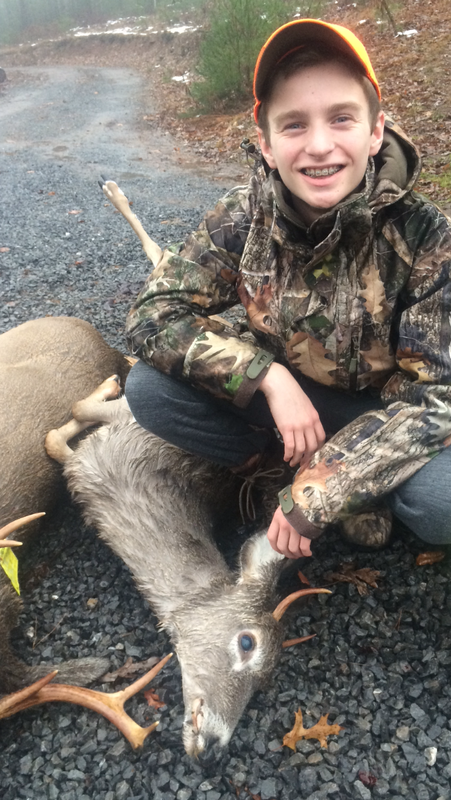 Yesterday my son “harvested” his first Pennsylvania deer (see photo below), a young spike buck that junior hunters are allowed to take, as the rest of us are limited to bucks with at least three points to a side of the antler rack. As we had incredible good fortune yesterday, and took other deer, my son decided to donate his deer to Hunters Sharing the Harvest. My boy is enjoying the act of charity and contributing towards the basic welfare of his community. Both Deimler (Cumberland County) and Sensenig (Dauphin County) are deer processors close by our home, so either one would be the logical place to drop off the young buck. But Deimler has the advantage of being right down the road from Johnson’s Furs, where we have our furs tanned and where we buy our trapping supplies, so that is where the critter has been dropped off. Mutli-tasking, ya know? And that is the neatest thing about this Hunters Sharing the Harvest option: We get to share our cake, and eat it, too, in the charitable spirit of the Holiday Season.